Opening statement ... "It's obviously disappointing to lose; you don't play to lose. It is disappointing -- we need to execute better in multiple areas, and when the opportunity comes we need to take advantage of it. And you've got to make plays. We didn't do that throughout the game. There were also an awful lot of good things that our team did. I can tell you that I was pleased with the physical effort that they put through. We had Thomas Gordon -- he played 91 plays -- and he played a fast, physical 91 plays. And so did Jarrod Wilson. Both of them are key elements in our punt game. I'm just talking about those two guys but how guys like Jeremy Gallon play, and you watch our team play and the physical effort was very good. Now let's go back to the mental effort because it takes both. Mentally we had some things that we need to do better, from a standpoint of targeting on the line of scrimmage and blocking or finishing a little better on blocks with the angles. If you're playing in coverage, making sure that we're playing the coverage out. If you're the nose tackle, you need to make sure you're stepping with the proper foot -- all those things -- we could execute there better, and we will. I like our football team; there's elements of it that need to produce a little more, need to have a little more urgency to how we're playing. But I like our team. We've got Indiana coming in here this weekend, and they are a good football team. Kevin (Wilson)'s done a nice job offensively. They have a lot of a lot of skill sets that they use. Defensively, I think they're more athletic than they've been in the last couple of years." On Taylor Lewan's status for Saturday ... "He'll be fine, I think he got -- really I think it was two things -- a little bit of a hip deal, that was probably most of it." On if Michael Schofield could move to guard among other possible changes to the offensive line ... "Probably not -- the one thing is that Mike Schofield, in that football game, he was asked to do a lot when Taylor (Lewan) went out. The unbalancing, the shifting -- he orchestrated all that with those guys. At one time I think there were three redshirt freshmen, redshirt sophomore in there with Scho. He did a really nice job, he played well, and he did a nice job of organizing those five guys. We had Chris Bryant come out and (Joey) Burzynski go in; he did a nice job. We'll go through Tuesday and Wednesday and see." On what needs to improve with offensive line ... "When you look at it I think they've been hit and miss a little bit. There are times when they play well, and there are times when they haven't played as well. Now, you have to look at their preparation and talk to them about it. We had good preparation all week; we were physical. I know watching the things we do against each other, I thought they were really good. Now we need to keep taking it further." On if the offensive will develop more of a spread look ... "I think there are times when we have still done that. The problem is -- I think Devin (Gardner) ran the ball 27 times the other day, and most of them were called runs not scramble runs; you worry about how many hits he's taking. We've got to get production from the back end, the running backs." On the play calling late in the game ... "We threw the ball at the end of regulation. We put ourselves in position to kick a 52-yard field goal. There were 20 seconds left, we could've just taken a knee and played for overtime. So I would say no (we did not get conservative)." On if the team is struggling to develop an identity ... "If they are then I haven't done a good enough job expressing what kind of team we need to be and want to be -- physical at the line of scrimmage on both sides of the ball. It can depend on the team we're playing. Last week we played a lot of snaps out of a nickel defense because of number one how we thought we stood up to them and their passing game, and I think there were some pretty good things out of it. We hit the quarterback 18 times, sacked him four, two interceptions. From an offensive perspective, point-of-attack blocking has to better, and I know it can be better. Our fullbacks are pretty good lead blockers when we're in 21, there's times when everything is blocked on play side. Things that bother you -- when it's blocked really well and a guy slips in from the backside because we didn't do a good enough job of cutting off. I think every week you've got to look at what gives your guys the best chance to win, and we look at that and make evaluations. Now, did we think we could run the ball more effectively? I don't think there's any doubt. Then you've got to change a little bit, and I think Al (Borges) did that during the course of the game." On whether he considered using a timeout when Devin Gardner lost his helmet and had to sit out a play ... "We did, we thought about it -- but it's the second half, and you need those things. When it's that kind of game, I don't know anybody who didn't think it would be a game that went down to the wire; I certainly did. So I didn't really want to use the timeout then." On the delay-of-game penalty in the fourth quarter ... "That was me -- totally. It was my fault. I've got to help (Devin), and I let him down." On communicating over the coaching headset ... "(I use it) at the end of the game and into the half. 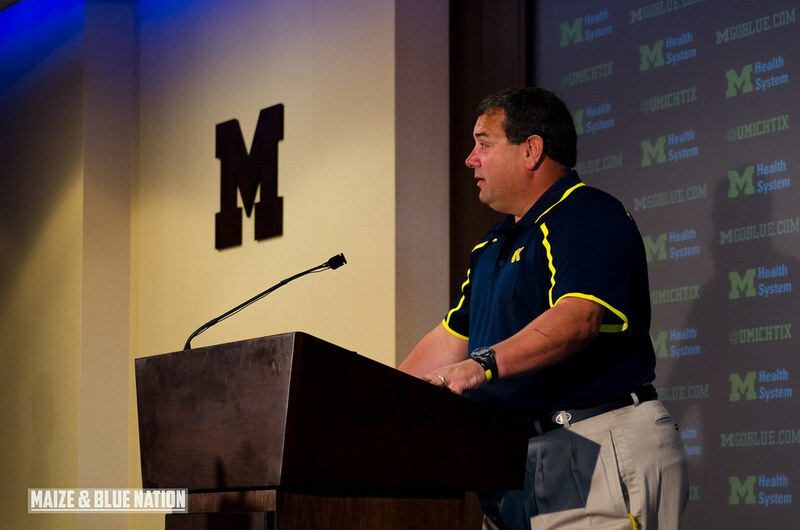 Greg (Mattison) and I talk all the time, so I don't have to use it because we're standing next to each other. I talked to Al before halftime, what we wanted to do at halftime, what his thoughts were, what we wanted to change. Then I talked to him at the end of the game. Do you take the knee with 20 seconds and play for overtime or try and throw it down the field? With the possibility of getting hit in the backfield, or the chance that they'll intercept or the chance that you'll move it down the field." On playing freshman cornerback Channing Stribling late in the game ... "Stribs is coming on, number one. If there was anybody I would want back there, to be honest, in our secondary to make an interception, it would be Stribling. I would still to this day because of his skill level and his ball skills are really, really good. I watch him every practice and every one he takes two or three balls. We wanted to get him in the game because of what we asked him to do." On any concerns with the kicking game ... "(Brendan Gibbons) was 23-of-23 from 40 yards in coming into the ball game. He hit the ground on the first one with his toe, which I was never a kicker, so you're going to have to take it from him. Obviously, it was low -- it wasn't blocked by them it was low by us. And he pushed the other one. But he nailed a 40-yarder at the other end, and the 52-yarder was right there at the limit. I know one thing; he won the Sugar Bowl for us, made a kick here at home to beat Michigan State. I've got a lot of faith in that guy."